A female two-toed sloth hangs loose at a the site of a new UW–Madison study of sloth ecology and behavior. The study, involving UW–Madison wildlife ecology researchers Zach Peery and Jonathan Pauli, depends on a complex of intact Costa Rican forest, pasture, plantation and shade-grown cacao as a laboratory. 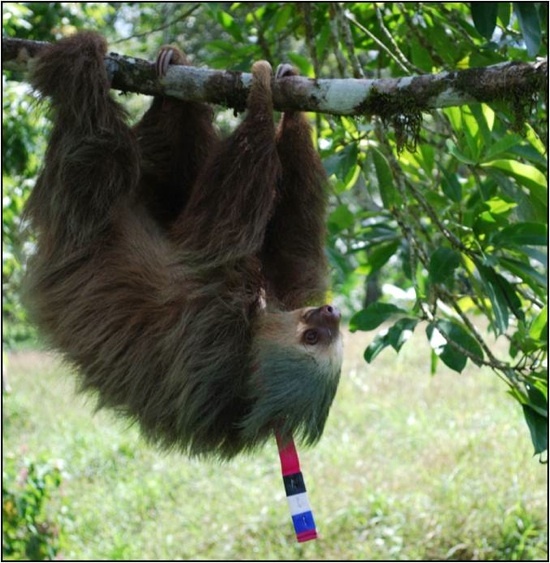 The colored necklace, with distinct color combinations, is used to identify female sloths in the field. Males get radio collars. Like many Neotropical fauna, sloths are running out of room to maneuver. As forests in South and Central America are cleared for agriculture and other human uses, populations of these arboreal leaf eaters, which depend on large trees for both food and refuge, can become isolated and at risk. But one type of sustainable agriculture, shade grown cacao plantations, a source of chocolate, could become critical refuges and bridges between intact forests for the iconic animals. In an ongoing study in Costa Rica, wildlife biologists from the University of Wisconsin–Madison are using a complex of intact tropical forest, pasture, banana and pineapple plantations — all connected by a large shade-grown cacao farm — as a field laboratory to explore the ecology of two species of sloths in a rapidly changing environment. But some of that mystery is now being peeled away as studies by the Wisconsin team of both the brown-throated three-toed sloth and Hoffmann’s two-toed sloth, two fairly common species, are yielding new insights into their mating habits and how the animals transit the landscape. “Because of the diverse overstory of native trees, the cacao farm appears to provide excellent habitat for both species of sloths,” explains Peery. Sloths also turn up in the few relic trees in pastures adjacent to the cacao farm, and the Wisconsin researchers hope to find out if the animals are using that habitat as spillover. “And then, of course, we want to compare sloth populations in cacao to populations in intact tropical forests to see if cacao provides habitat that is of as high of a quality as their natural forests,” Peery says. To flesh out sloth ecological parameters, however, requires a better basic understanding of sloth behavior, knowledge the Wisconsin group is now beginning to accumulate. In addition to contributing to the store of basic sloth knowledge, the work of the Wisconsin researchers should help wildlife and land managers in the Neotropics make sound decisions to better balance development and conservation.